WE ARE ADOPTING A SIBLING GROUP OF 6! This time our adoption journey is taking us to Ohio to three brothers and three sisters who have been waiting in the foster care system a very long time for their forever family. And in just a few weeks, we will have the opportunity to meet them for the first time. Unlike our previous adoptions, this one is a little more complicated because three of the children have very specific medical needs that will require us to make some modifications to our home. In particular, one of our daughters has Cerebral Palsy and is in a wheelchair. She will require full assistance for things like bathing, getting in and out of the car, and in and out of our home. Remodeling a bathroom to accommodate for her wheelchair and walker and building a wheelchair ramp on the front and back of our homes are necessary. We also know that this is just the beginning. We began our foster and adoption journey over 10 years ago. 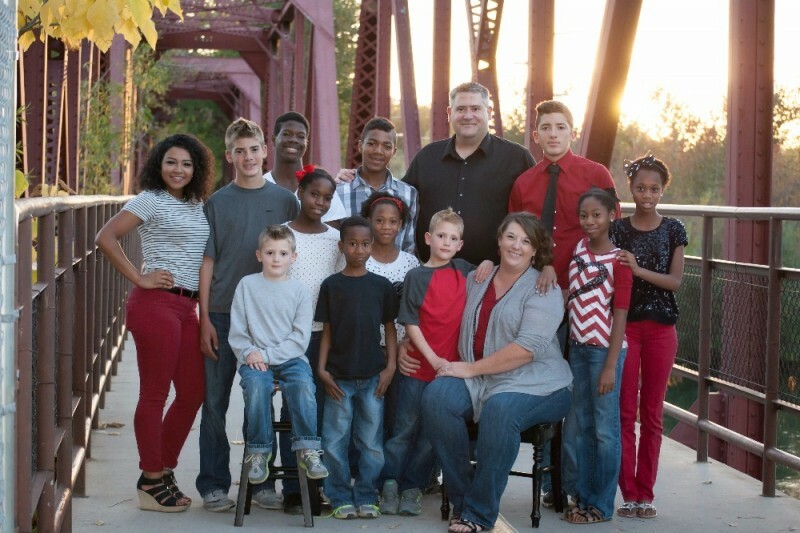 We have fostered dozens of children and this will be our 5th adoption. This adoption means we are growing from 14 to 20! Statistically, children in foster care who are African American, who are part of a large sibling group, who are older than 4, and/or who have medical or mental health issues are likely to never be adopted. Can you imagine living without a mom or dad to hug you when you have had a bad day? To teach you to drive? To pray with, laugh with, and love you unconditionally? Adoption changes all of that and so much more. And, not just for the adoptee, but for the family that grows along with them. Many people call our children "blessed" because they were adopted and we disagree -- we are the blessed ones. We learn from their resilience, are encouraged by their bravery, and are touched by their hope in family. You can read more about our family, the children, and how we found them on our blog, www.grinandbarrus.com. We are so very grateful for the many people that bless our family every day. Your support of our adoption journeys, the love you share with our family, and your prayers are some of the many things we are grateful for every single day. Two really awesome things happened this week. First, we got clearance to FLY! That means we get to officially travel to meet our children for the first time. I'm already a bucket of nerves! Second, we received word that a caseworker is flying all the way from Ohio to make sure our home is ready for our kiddos. That means our need is more urgent now then before. We are so very grateful to everyone who has donated! Please keep sharing -- you are literally answering our prayers and showing the world that the worth of souls is priceless! Much love from all of us! We don't know you, but your story touched us!